Better, Faster Ways to Develop and Refine Ideas Engineers have an exciting, competitive advantage when they’re using MakerBot. Just ask the team at Gossamer, a Dallas-based firm that develops new products for startups and entrepreneurs. When Chris Hsiao, Founder and Principal at Gossamer, agreed to build Teal, the world’s fastest production drone, he bought a MakerBot 3D Printer to help Gossamer pursue new possibilities during the prototyping process. After purchasing the MakerBot Replicator 3D Printer, Gossamer could experience the rapid iteration, real-time decision making, and proven returns that 3D printing enables. Using MakerBot, Hsiao accelerated iteration, avoided outsourcing costs, and created a final prototype of Teal that was ready for manufacturing. A Revolutionary Product Design Goal George Matus Jr., the Founder and CEO of Teal, had a dream of creating a drone that’s incredibly fast, powerful, and functional. He hired Hsiao’s team to build Teal in a way that’s fully-modular, durable, and easy-to-use, without compromising its sleek, futuristic aesthetic. Based on his experience in aerospace design, Hsiao knew that creating this type of drone would be similar to creating parts for an airplane. “Everything on an airplane is iterative. There’s rarely any new innovation you haven’t seen before,” he shared. As a result, Teal wouldn’t require any newly-designed aeronautic parts; the focus would be on tailoring legs, covers, frames, battery cases, and other parts to create a drone that fits Matus’ design goals. “If we were going to make parts for a drone, we have the option of drafting them up in Solidworks. But we needed to actually get a feel for the parts in our hands because the shapes are so organic. Making the parts out of sheet metal or machining would’ve also been too costly,” Hsiao says. “So we went out and got a MakerBot. It was an easy decision to buy it, given the price, and the expensive, time consuming tasks it replaces. Its paid for itself several times over.” Easy Workflow Integration and Fast Results “The speed is the first thing you notice. Typically, it takes us days to create new models in foam or wood, and outsourcing can take weeks. Using our Replicator, we were able to have prototypes within a few hours,” Hsiao shares. This helped Hsiao speed up ideation and iteration, which kept him on track for this project’s deadlines. It was easy for the team at Gossamer to integrate MakerBot into their workflow. They began by using Teal’s conceptual design to create an engineering draft. Then, they would 3D print the draft to get a sense of how it would look and feel. If they felt good about the print, they’d send the draft’s file to Matus. They’d use Matus’ feedback to lead the next round of iteration. Using MakerBot, it was easy to continuously amend and enhance their designs. During their time on this project, Hsiao upgraded to using the Smart Extruder+, which enhanced his experience with the printer. “The Smart Extruder+ substantially improved our 3D printing process. Its dependable performance has really helped us keep a steady, consistent workflow.” A Perspective You Can Trust By 3D printing with MakerBot, Hsiao could complete difficult engineering tasks with ease. “The Teal’s body required us to build some complex shapes and fine details into our designs. We needed to create smaller parts that snap together well, while facilitating the ideal arrangement of motors and electronic components,” Hsiao explains. With the possibility of a design being off by just a millimeter, having the ability to 3D print their parts gave them insight into what worked and what didn’t. Altogether, the Gossamer team 3D printed high-quality, functioning Teal prototypes by creating the upper shroud, bottom shroud, bottom battery case, battery cover, and center frame. They paired the 3D printed arms with Lumenier Propellers, which is a standard off-the-shelf choice for most drones. “Being able to create quick, high quality prototypes gave us a better feel for the sort of organic shapes we were designing, while letting us check the physical fit and test different orientations. It helped us really hone and perfect these parts.” After just a few months of iterating, the Gossamer team finalized their Teal prototype and handed it off to Matus for manufacturing. Benefits: A Teal That’s Ready to Launch With speeds at over 70 miles per hour, Teal is set to lead as the world’s fastest production drone. It’s fully-modular, making it easy to add new parts or replace old parts without affecting the rest of the model. 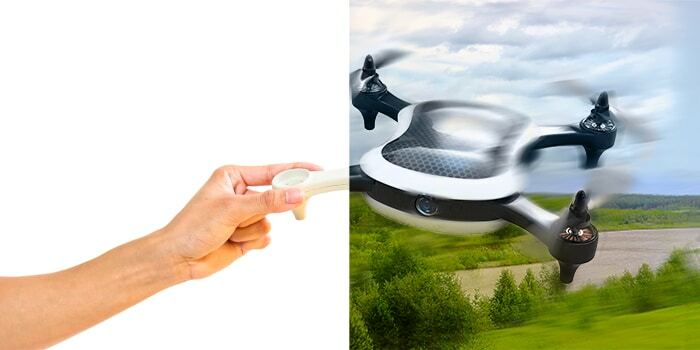 The drone features an electronically stabilized built-in camera, an onboard Nvidia TX1 Processor, high performance battery with 10 minute flight, high endurance battery with 20 minute flight, and more. Upon purchasing, customers will receive a ready-to-fly Teal that’s fully customizable and upgradable. Set for release in early 2017, Teal may have what it takes to spark a new standard for drones. An Exciting Future for Hardware Product Development Gossamer continues to explore new projects with MakerBot. Hsiao and his team have been given early access to the MakerBot Replicator+. Extensively tested, the Replicator+ is engineered to provide faster, easier, and more reliable 3D printing. “The Replicator+ further streamlines our iterative design process. Its larger build volume and faster print times help us finalize prototypes faster, making it possible to get even more done in a day,” Hsiao says. Using advanced iterative development, Gossamer’s team of engineers and designers have the opportunity to continuously act and improve upon their ideas. They can more effectively test and evolve ideas to generate proven returns. “Rapid prototyping is part of how we describe Gossamer to potential clients. Our ability to perfect ideas and turn around projects quickly is a great competitive advantage, and MakerBot’s printers have helped make that possible,” Hsiao shares. By continuing to push the boundaries of possibility with MakerBot, Gossamer is making product design faster, more affordable, and easier to accomplish than ever before. About Gossamer Startups trust Gossamer to get their most valuable ideas off the ground. This Dallas-based hardware development and labor venture firm can handle every part of the product development process, from design to prototyping to mechanical engineering. Complete with a design team, machine shop, and top tier in-house engineering staff, Gossamer transforms concept sketches into products that are ready for manufacturing. With a growing client roster that includes Teal, Toyota, and Airbus Helicopters, Gossamer works with companies across the country to push the boundaries of product design.